Innovision (21.10.2016) - PHILATAIPEI 2016 World Stamp Exhibition - Taiwan blue magpie. Pictorial joint cover with the ATM issues on sale over the exhibition. SPAIN - 4 x Tarifa C (International - Non Europe mail). 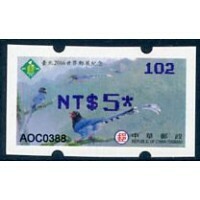 TAIWAN - Blue magpie with the four colours (4 x NT$5). Special postmarks and postal marks - PHILATAIPEI 2016. Innovision (21.10.2016) - PHILATAIPEI 2016 World Stamp Exhibition - Taiwan blue magpie. Machines 100 - 101 - 102 - 103 - 104 - 105 - 110 - 120. BLACK + BLUE + GREEN + MAGENTA imprint. Set of 32 mint ATMs, domestic mail (32 x NT$5). All the combinations. Innovision (21.10.2016) - PHILATAIPEI 2016 World Stamp Exhibition - Taiwan blue magpie. BLACK + BLUE + GREEN + MAGENTAimprint. Pictorial first day cover with the EIGHT combinations available on the first day (8 x NT$ 5). ENGLISH & CHINESE first day postmarks. Innovision (21.10.2016) - PHILATAIPEI 2016 World Stamp Exhibition - Taiwan blue magpie. Machine 100. BLACK + BLUE + GREEN + MAGENTAimprint. Commemorative folder / folio with the four sets for domestic mail (4 x NT$ 5-12-25-32), printed by the machine with the four colours imprint. Innovision (21.10.2016) - PHILATAIPEI 2016 World Stamp Exhibition - Taiwan blue magpie. Machine 105. BLACK + BLUE + GREEN + MAGENTAimprint. Commemorative folder / folio with the four sets for domestic mail (4 x NT$ 5-12-25-32), printed by the machine with the four colours imprint. Innovision (21.10.2016) - PHILATAIPEI 2016 World Stamp Exhibition - Taiwan blue magpie. Machine 120. BLACK + BLUE + GREEN + MAGENTAimprint. Commemorative folder / folio with the four sets for domestic mail (4 x NT$ 5-12-25-32), printed by the machine with the four colours imprint. Innovision (21.10.2016) - PHILATAIPEI 2016 World Stamp Exhibition - Taiwan blue magpie. Machine 100. BLACK + BLUE + GREEN + MAGENTAimprint. Commemorative folder / folio with the four sets for international mail (4 x NT$ 9-13-15-17), printed by the machine with the four colours imprint. Innovision (21.10.2016) - PHILATAIPEI 2016 World Stamp Exhibition - Taiwan blue magpie. Machine 105. BLACK + BLUE + GREEN + MAGENTAimprint. Commemorative folder / folio with the four sets for international mail (4 x NT$ 9-13-15-17), printed by the machine with the four colours imprint. Innovision (21.10.2016) - PHILATAIPEI 2016 World Stamp Exhibition - Taiwan blue magpie. Machine 120. BLACK + BLUE + GREEN + MAGENTAimprint. Commemorative folder / folio with the four sets for international mail (4 x NT$ 9-13-15-17), printed by the machine with the four colours imprint. Innovision (21.10.2016) - PHILATAIPEI 2016 World Stamp Exhibition - Taiwan blue magpie. Machine 076. BLACK imprint. Mint ATM (NT$1). Innovision (21.10.2016) - PHILATAIPEI 2016 World Stamp Exhibition - Taiwan blue magpie. Machine 076. BLACK imprint. Mint ATM, domestic mail (NT$5). Innovision (21.10.2016) - PHILATAIPEI 2016 World Stamp Exhibition - Taiwan blue magpie. Machine 081. BLACK imprint. Mint ATM, domestic mail (NT$5). Innovision (21.10.2016) - PHILATAIPEI 2016 World Stamp Exhibition - Taiwan blue magpie. Machine 100. BLACK imprint. Mint ATM, domestic mail (NT$5). Innovision (21.10.2016) - PHILATAIPEI 2016 World Stamp Exhibition - Taiwan blue magpie. Machine 101. BLACK imprint. Mint ATM, domestic mail (NT$5). Innovision (21.10.2016) - PHILATAIPEI 2016 World Stamp Exhibition - Taiwan blue magpie. Machine 105. BLACK imprint. Mint ATM, domestic mail (NT$5). Innovision (21.10.2016) - PHILATAIPEI 2016 World Stamp Exhibition - Taiwan blue magpie. Machine 106. BLACK imprint. Mint ATM, domestic mail (NT$5). Innovision (21.10.2016) - PHILATAIPEI 2016 World Stamp Exhibition - Taiwan blue magpie. Machine 110. BLACK imprint. Mint ATM, domestic mail (NT$5). Innovision (21.10.2016) - PHILATAIPEI 2016 World Stamp Exhibition - Taiwan blue magpie. Machine 120. BLACK imprint. Mint ATM (NT$1). Innovision (21.10.2016) - PHILATAIPEI 2016 World Stamp Exhibition - Taiwan blue magpie. Machine 120. BLACK imprint. Mint ATM, domestic mail (NT$5). Innovision (21.10.2016) - PHILATAIPEI 2016 World Stamp Exhibition - Taiwan blue magpie. Machine 130. BLACK imprint. Mint ATM, domestic mail (NT$5). Innovision (21.10.2016) - PHILATAIPEI 2016 World Stamp Exhibition - Taiwan blue magpie. Machine 076. BLACK imprint. Nine mint ATMs, values between NT$1 to NT$9. Innovision (21.10.2016) - PHILATAIPEI 2016 World Stamp Exhibition - Taiwan blue magpie. Machine 081. BLACK imprint. Nine mint ATMs, values between NT$1 to NT$9. Innovision (21.10.2016) - PHILATAIPEI 2016 World Stamp Exhibition - Taiwan blue magpie. Machine 102. BLACK imprint. Nine mint ATMs, values between NT$1 to NT$9. Innovision (21.10.2016) - PHILATAIPEI 2016 World Stamp Exhibition - Taiwan blue magpie. Machine 103. BLACK imprint. Ten mint ATMs, values between NT$1 to NT$10. Innovision (21.10.2016) - PHILATAIPEI 2016 World Stamp Exhibition - Taiwan blue magpie. Machine 104. BLACK imprint. Ten mint ATMs, values between NT$1 to NT$10.